The Making of Ant Attack! Someone sent me this clip and wow, what memories came flooding back. Ant Attack on the ZX Spectrum was the first computer game that not only totally hooked me, but made me think "I wanna be able to do that". At one point, circa 1984, I could even beat the "hall of fame" high scores published in Personal Computer Games (PCG) magazine, though I was much too shy to write in about it. One of the dubious joys of the Spectrum was getting to actually hear programs loading. Games could take upwards of 20 minutes to load from cassette tape - which meant you made damn sure you made the effort to enjoy them - and as they loaded you could hear the whistles, chirps and drones of the bits and bytes of game code. Every game had its signature loading sound and I can still immediately recall the last few clicky seconds of Ant Attacks loading before it launched into the beepy tune that accompanied the blocky title screen. I moved on to searching through the programs memory image, looking for the data for the "city" that was the game area, then printing it out in long strips on my Alphacom 32 toilet roll printer and sellotaping them together into a map which I proudly blu-tacked to my bedroom wall. Anyway it was a joy for me to see this interview with Sandy White, the creator of Ant Attack. i had no idea what he even looked like before seeing this, and I only remember his name from the big "(C) SW" laid out in bricks on the city map in the game, which I remember noticing when I printed out the map. I was pleased to see Sandy White HAND ASSEMBLED all the machine code for the game.. now this really does bring back memories as I used to do this myself, on a much simpler scale, armed only with the list of Z80 assembly language instructions that were printed alongside the character set at the back of the ZX Spectrum manual. Top stuff! Hey I even used to hand assemble Z80 machine code without a reference list, just by remembering all those opcodes from looking them up so many times. I really should have got out more. 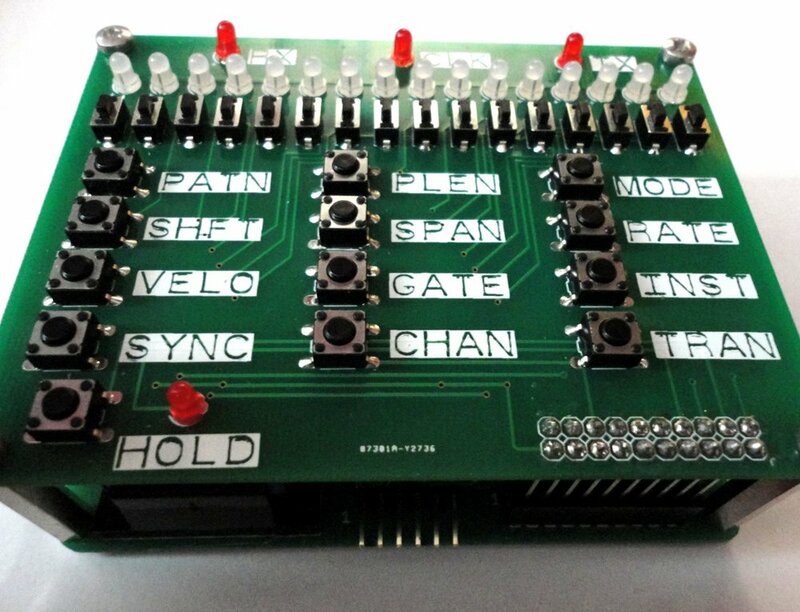 Since I made my first Arduino-powered MIDI arpeggiator a couple of years back I have been meaning (and promising) to get a kit together so others can build their own. Today I listed my first "fundraiser" on Tindie. 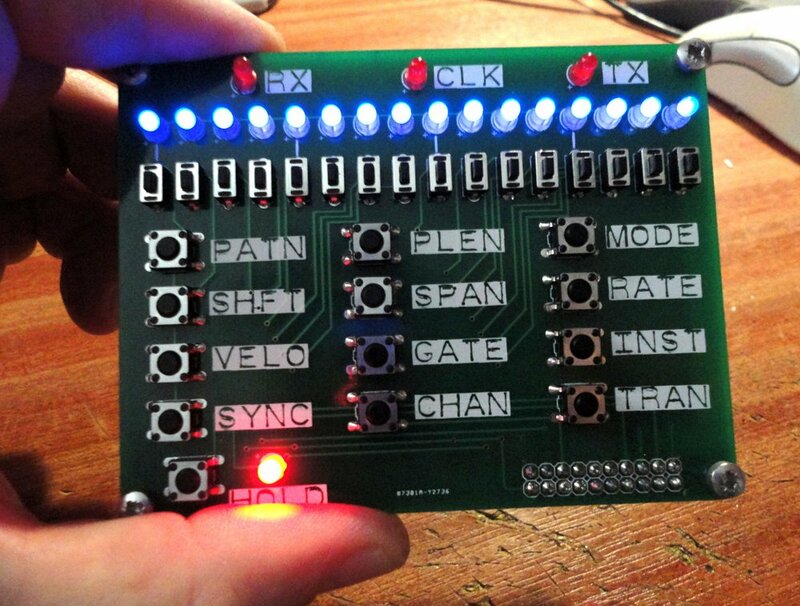 Hopefully that will raise enough cash get the PCBs made up for 50 of these little beasties! I wanted to preserve the look of my original arpeggiator build, which was in a bright yellow case with black Dymo embossed tape labels. I went for a "Dymo" feel to the PCB silkscreen in this latest build. I made them up in a drawing package and imported them into EAGLE as .bmp files. 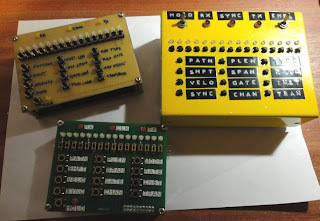 Although my initial prototype PCBs are standard PCB green, I hope to go for bright yellow soldermask (boards) and black silkscreen (text) in the production run. On the back of the control surface PCB are two 74HC595D surface mount shift registers. 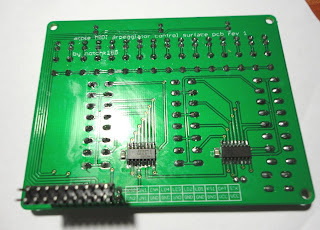 When I release the kit I will solder these myself, leaving just the easier through-hole stuff to be added. The shift registers are used to scan the switches and drive the LEDs so that only 5 digital I/Os (3 ouputs and 2 inputs) are needed to drive the sixteen blue LEDs and poll the sixteen 6x3mm "Data Entry" tactile switches and the twelve 6x6mm "Menu" tactile switches. The low side of the LEDs is controlled by a 2N3904 transistor. By switching an LED on then off "early" in its refresh cycle we can get multiple brightness levels.. a kind of "poor man's PWM". The scan cycle is controlled by a timer interrupt. Although there is no actual Arduino board used - this is an Arduino project - with Atmega328 and 16MHz crystal on board. As with most Arduino projects, all the clever stuff happens in the firmware. We send MIDI simply using the Serial port (31250 baud rate). The MIDI spec tells us to optically isolate the serial input to avoid possible grounding issues between equipment so a 6N139 opto-isolator IC sits on the MIDI input. A feature of the ARPIE is to be able to "slave" to a MIDI SYNCH source which is different to the MIDI input where the notes are being received. For example we might have a keyboard on MIDI IN but want to get our SYNCH from a drum machine. MIDI SYNCH is achieved through special "tick" messages which arrive at a MIDI input in real time (24 ticks for every beat) so we need a second serial interface to receive these. Since this is rather crucial for timing synchronisation, rather than "soft serial" I decided to add a second microcontroller (PIC12F1822) to manage synch. 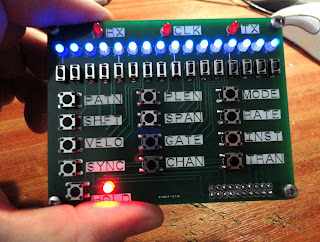 The PIC listens for the incoming MIDI synch messages and "interrupts" the Atmega328 by pulsing its INT pin each time a tick message comes in. The PIC has its own 6N139 isolator. Apart from the battery and voltage regulator stuff, that is pretty much it for the hardware. I am quite pleased with the usability of this box - despite the minimality of the user interface it is mostly intuitive once you get used to it (OK so there are some exceptions, like the need to set the tempo in binary coded decimal :o). For most operations you press a menu button, which changes the meaning of the LEDs and data entry buttons for that function. After a period of inactivity it always goes back to "pattern" mode.